Anyone who’s seen the funky movie Rio knows of the Spix’s macaw, the beautiful and goofy blue bird thought to be among the last of his kind in the film. While the character Blu succeeds in saving his species by falling in love and ultimately becoming a father, the reality isn’t nearly as sweet. The Spix’s macaw is one of eight bird species confirmed or likely extinct in the wild, according to an eight-year-long analysis conservation group BirdLife International publicised Wednesday. Of those eight likely extinctions, five were in South America. The authors blame deforestation. “Ninety per cent of bird extinctions in recent centuries have been of species on islands,” said Stuart Butchart, a chief scientist at the organisation and lead author of the study published in an upcoming edition of Biological Conservation, per a press release. Tropical forests lost 39 million acres of tree cover in 2017. That’s detrimental to the animals who call these trees home. And the Spix’s macaw, which once spanned the region near São Francisco River in eastern Brazil, isn’t the only macaw to suffer. 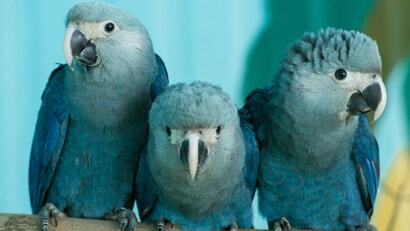 There’s also the Glaucous macaw, another blue parrot that hails from Brazil. Other birds the new study recommends re-classifying as extinct or possibly extinct on the International Union for the Conservation of Nature’s Red List include the cryptic treehunter and Alagoas foliage-gleaner, also from Brazil. The poo-uli, a stunning bird with a black face that hasn’t been seen in its native Hawaii since 2004, is also on the list. The authors looked at 61 bird species that hadn’t been spotted for more than 10 years or that have been seen in the last 10 years but have faced dramatic decline. From there, they examined any literature on the animals — 819 records and 356 surveys total — in addition to consulting with experts who’ve studied them. Controlling for the possibility of misidentifying species, the study assessed the probability that any threats occurred over the species’ entire range, and that these threats were severe enough to impact the species. With all that in mind, the authors arrived to their disappointing conclusion. Still, while Blu’s species hasn’t been seen in the wild for more than 18 years outside a lone sighting in 2016, up to 80 are alive in captivity, according to BirdLife International. And who knows? These recommendations aren’t made lightly, but there is always a sliver of hope that a Spix’s macaw is hiding somewhere deep in the forests of Brazil, waiting to be found.